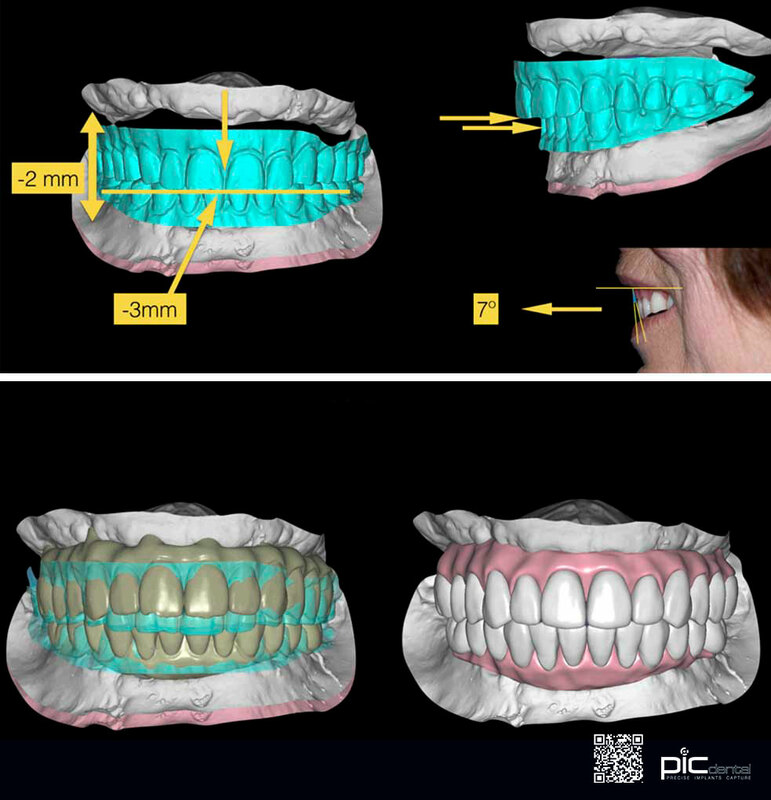 Photogrammetry in dentistry is considered as a good alternative to conventional impression techniques. 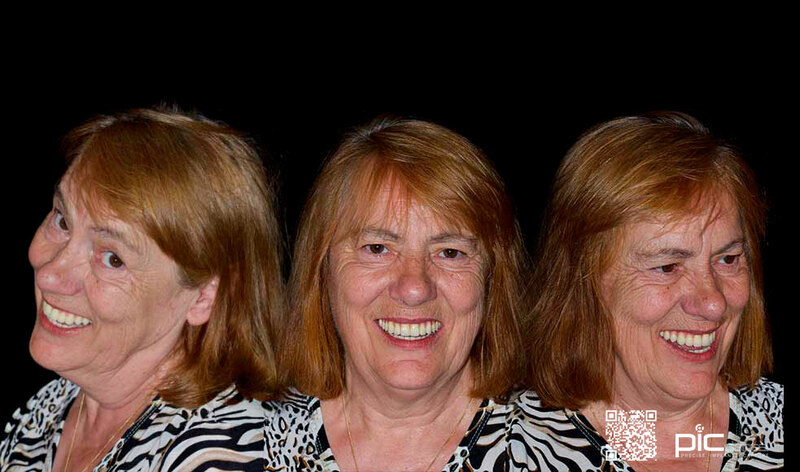 In the case of multiple implants, the photogrammetry has several advantages over other impression techniques. Some of these advantages are precision; rapidity; less complicity and conformable for both patients and dentists. PIC-Camera is a high-precision, 3D Stereo camera for intra-oral use. 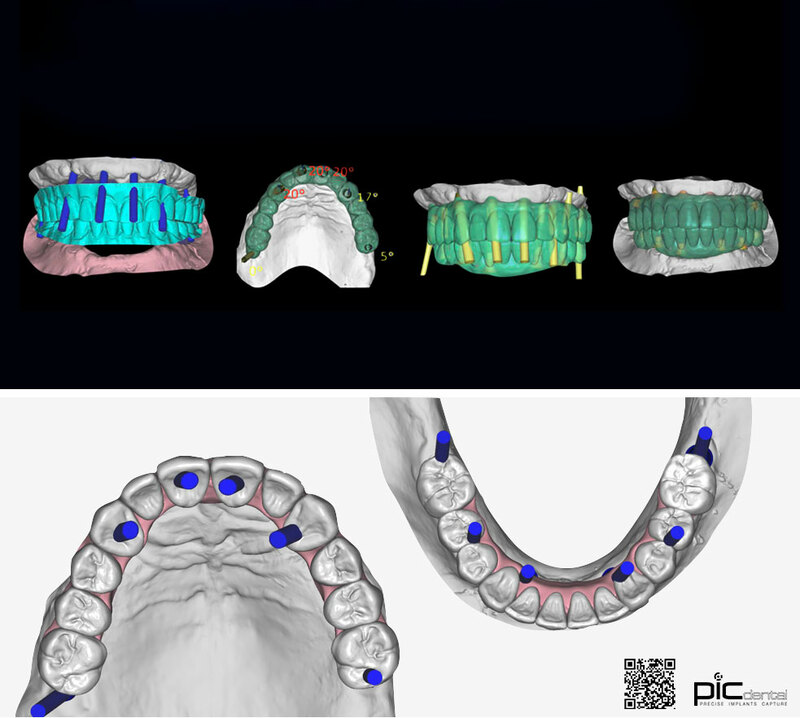 This is capable of capturing implants positions and therefore able to obtain an open STL file, which contains the geometry needed to design the final structures of implant supported restorations. 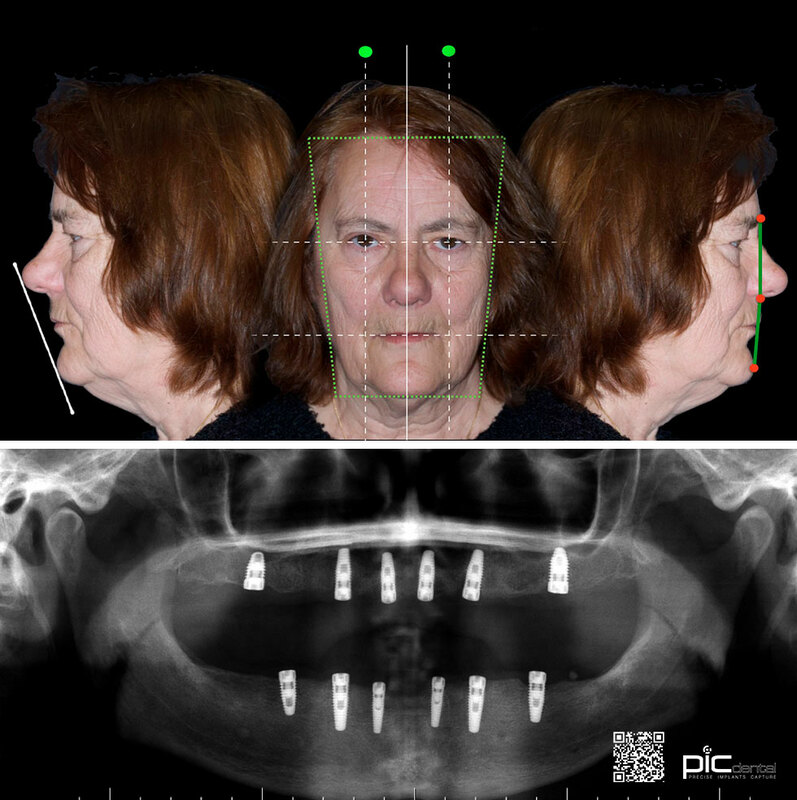 A 55-year-old healthy woman with no medical problems was referred by the department of periodontics to the prosthodontics department at the Complutense University of Madrid for prosthetic rehabilitation, she wore transitional removable complete denture, Intraoral examination showed six implants (NobelReplace Select Tapered PMC, NobelBiocare ), as well as six implants in the anterior mandible (NobelReplace Select Tapered PMC, NobelBiocare ). Clinical and radio-graphical analyses were undertaken. The treatment planning was discussed with the patient and informed consent was sought and obtained. 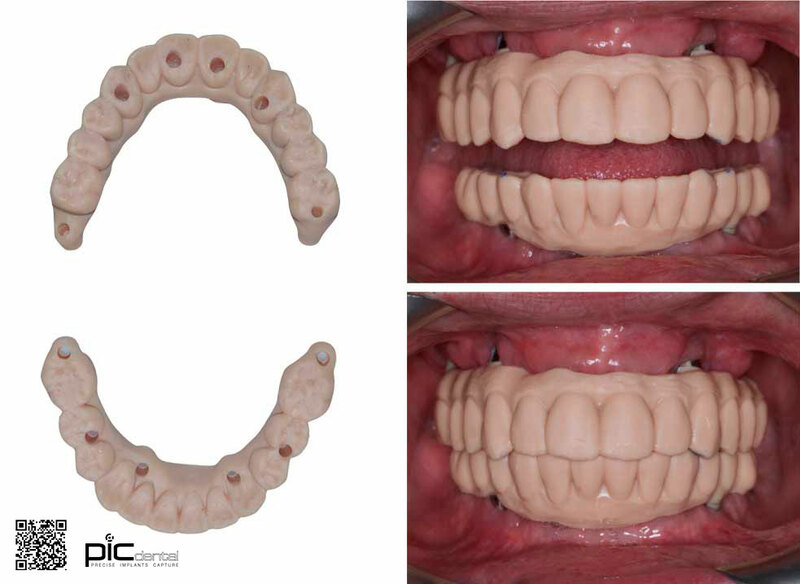 The treatment commenced by digital impressions of the upper and the lower prostheses. The scan information constituted the first stereo-lithography (STL) file. 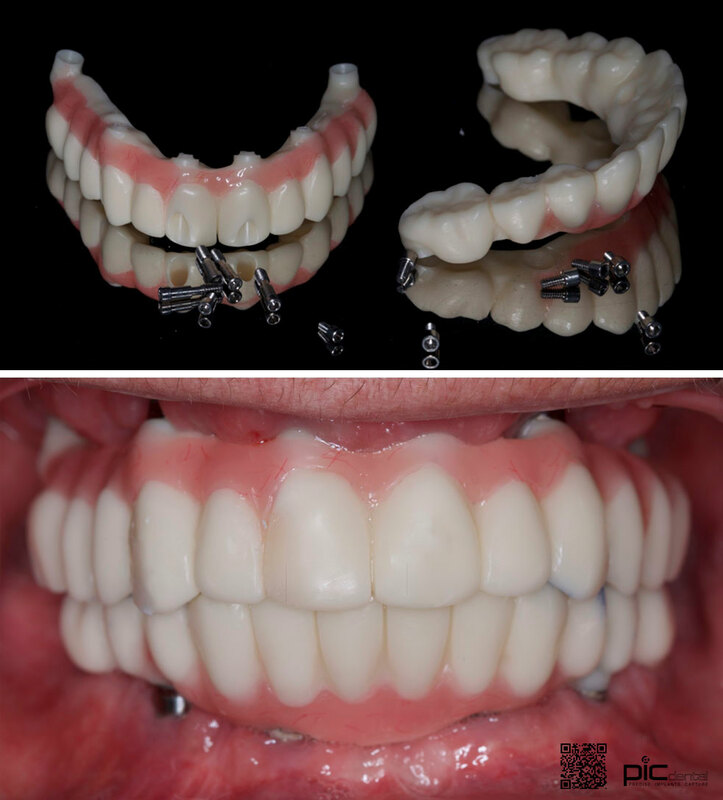 Both prostheses were removed and another digital impression of soft tissues and implants orifices were undertaken to create a second STL file. PIC Abutments were screwed into the implants and PIC Camera take-up to 10 shots every second, enable creating the third STL file (PIC File). 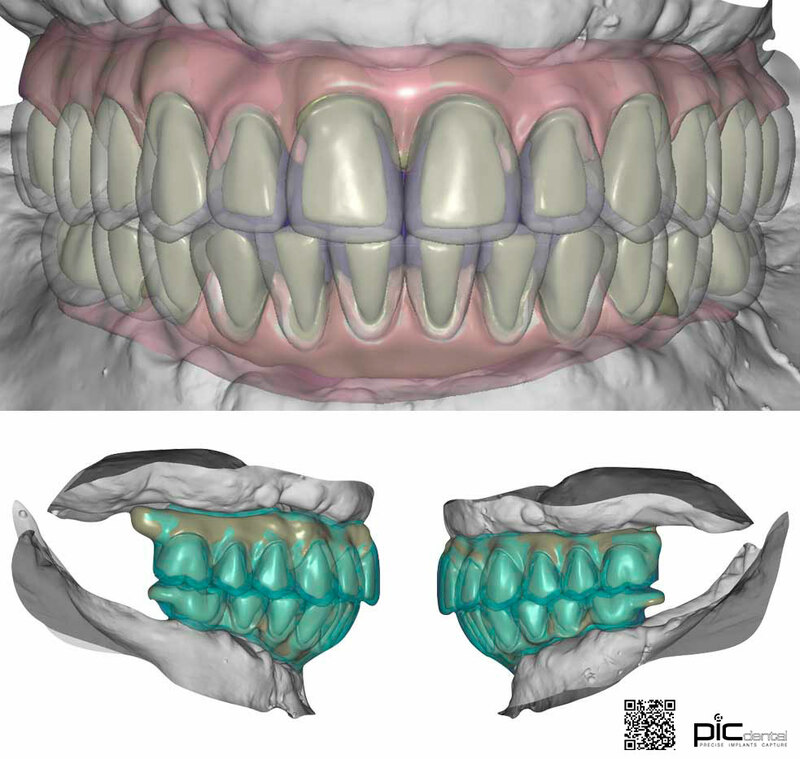 With Exocad-DentalCAD software, the transitional denture were modified virtually; then all three STL files integrated using an algorithm to find the best fit line of the frameworks. 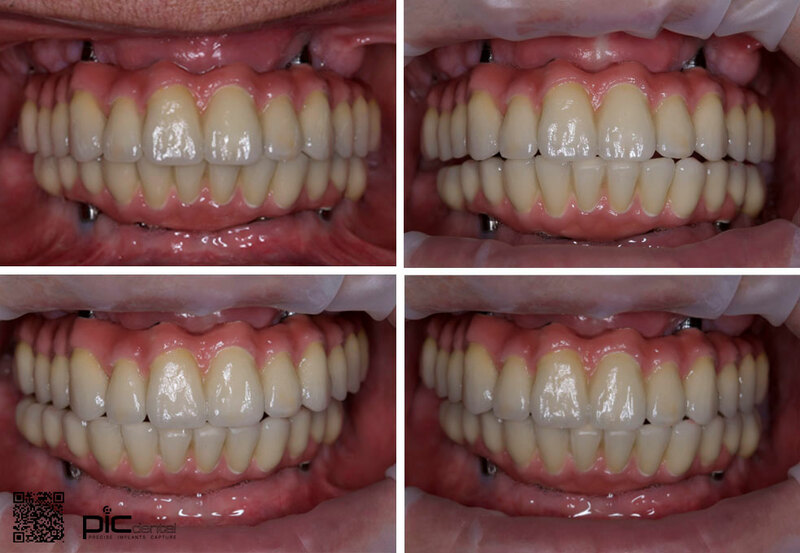 Provisional restorations were inserted after the evaluation of prototype trial denture had been done. 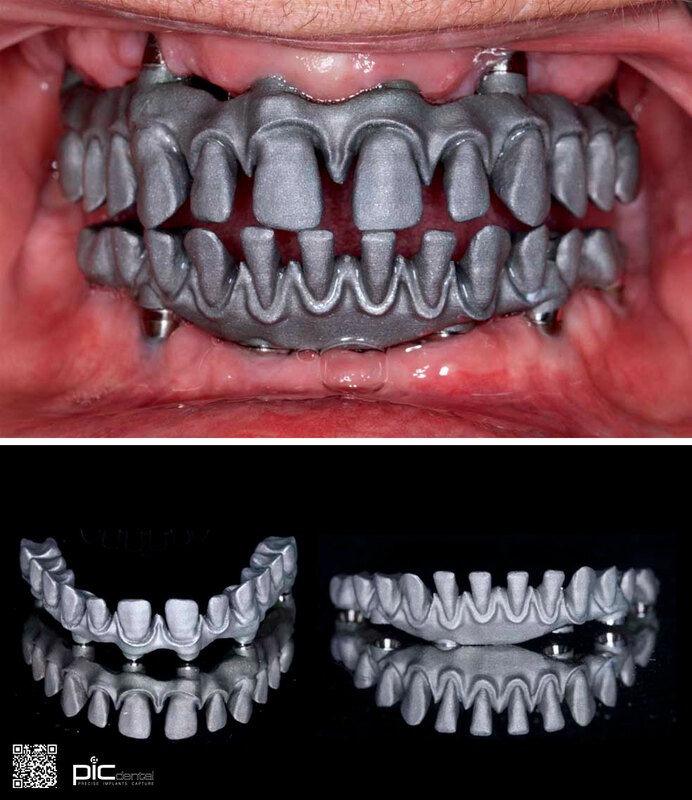 Six weeks later after radiographic and clinical follow-up, the metallic frameworks were fabricated. Both frameworks were tried-in the patient’s mouth, and Bisque try-in was undertaken previous to the insertion of the prostheses. 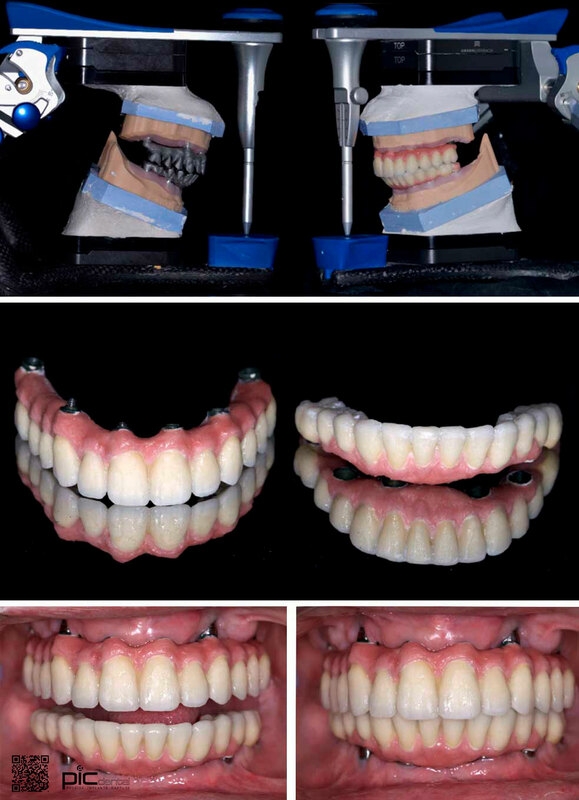 A favorable passive fit between the metallic frameworks and implants was obtained through photogrammetry impression technique. 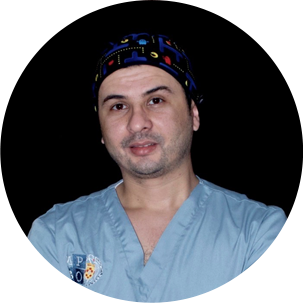 After twelve months of clinical follw-up the prosthesis did not show any screw loosening or any other type of mechanical or biological complications. 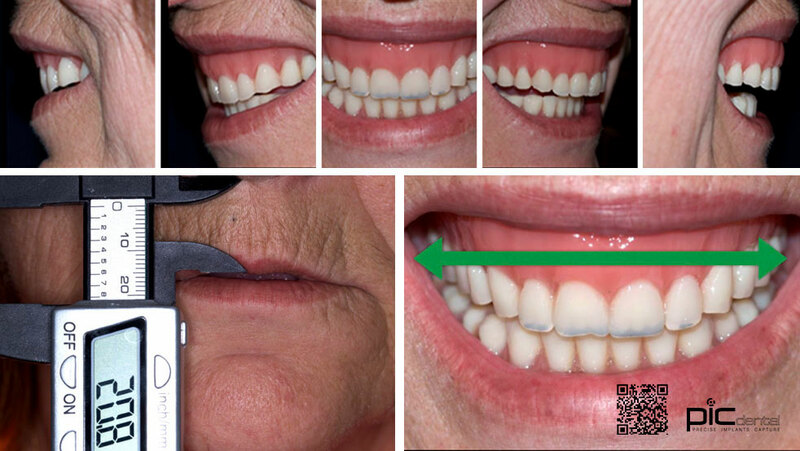 Photogrammetry impression technique for fixed complete dentures has multiple advantages compared to other conventional impression techniques. 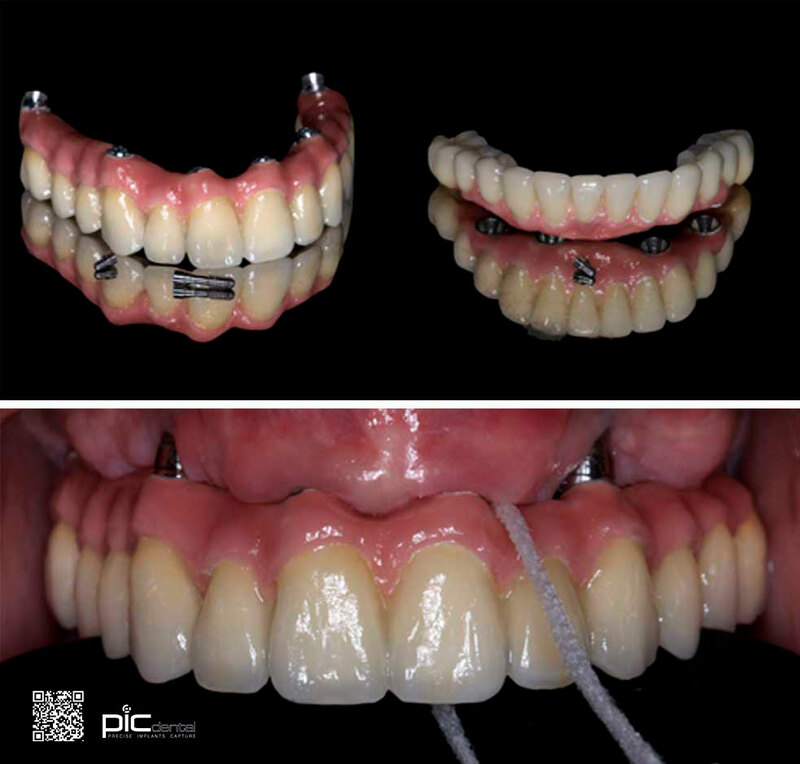 Additional explored advantages in this case report were favorable passive fit of frame works and therefore elimination the need of prostheses adjustments; elimination of impression accessory cost; the possibility to make immediate implants loading and full digital workflow.